Ferrari World Abu Dhabi is an entertainment and leisure theme park on Yas Island in the emirate of Abu Dhabi, UAE, with Ferrari-themed rides including the world's fastest roller-coaster, allegedly, and it will be the largest indoor theme park in the world. The soft-opening date of the park was 27 October 2010 at 1900 (7pm), with official opening ceremony on 30 November 2010. We took a trip on the Ferrari Rossa roller-coaster in November 2010, uttered every expletive we knew, and some we didn't know we knew. Frightening, exhilarating, and unbelievably fast at take-off. What a rush! Check the queue though, if it's busy then you might want to stump up for the premium tickets since after the first ride, you'll want to go again and again and again and ... well, we did. 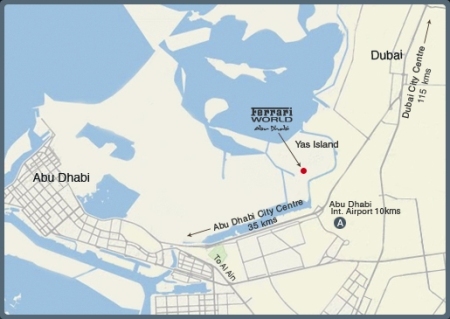 Location is near the Yas Marina Circuit on Yas Island, about 15 mins drive from Abu Dhabi International Airport, 30 minutes from Abu Dhabi City, and 1-1½ hours from Dubai. See location map (new window). Opening times from 1200 (noon) on Tuesday-Sunday, closed Mondays. But open on Monday 25 April 2011 for school holiday fun. Entry price expected to be comparable to something like Wild Wadi or Atlantis Aquaventure in Dubai which cost about AED 200 for unlimited use of attractions on the day. As of October 2010 opening date, many rides were not available, although the Ferrari Rossa roller coaster was working ... with long queues at busy times. Ticket prices were slightly lower (but not that much). Update March 2011 - most FW-AD rides operating now? Premium ticket holders allowed to jump the queues and relax in their own lounge area with free crisps and soft drinks but no tea or coffee when we visited in November 2010, even though we were told we could get a cuppa. Prices based on FW-AD information as of October 2010 but might change. Check with Ferrari World for official prices. First Gulf Bank Platinum credit card holders can receive a free upgrade from standard to VIP tickets (press release 20 April 2011, might be valid until April 2014?). Ferrari World Abu Dhabi (FWAD) on Yas Island is an entertainment theme park based on Ferrari motor cars. The largest indoor theme park and the first Ferrari theme park in the world according to Aldar press releases and FWAD information. Unclear whether they mean first and only, or first of many - FWAD information says "Ferrari World Abu Dhabi will be the world's largest indoor and only Ferrari theme park." Ferrari World indoor enclosed area open to the public according to FWAD FAQs (May 2010) is 86,000 sq meters (925,000 sq feet), and roof area is about 200,000 sq meters (2.15 million sq ft), which is about the size of a medium to large Abu Dhabi shopping center. One newspaper thought the park was a bit smaller at just 2,000 sq meters - "at the 2000-sqm park on launch day" (EB 20 July 2010). Ride and theme park designers are Jack Rouse Associates (JRA) of Cincinnati, USA. Interior fitout by Mivan Depa, a joint venture with the Dubai based firm Depa (AED 200m contract announced 18 August 2009). Ferrari World will be managed by Farah Leisure Parks Management, a joint venture between Aldar and ProFun Management Group. Ferrari World theme park Manager is Andy Keeling (June 2010). Official opening ceremony was held on 30 November 2010. Opening date was scheduled to be noon on 28 October 2010 - announced at the Spanish Grand Prix on 06 May 2010, and in press release 08 May 2010. Updated to 7pm on 27 October 2010 according to 27 September 2010 press release. Offical Grand Opening Ceremony to be held sometime in December 2010. February 2010 reports said that the opening date would be the second half of 2010 according to comments from Troy Lindquist, director of marketing and sales for Ferrari World Abu Dhabi. That might mean December 2010 (or 2011 after the usual unexpected delays in the UAE). September 2009 reports had the Marketing Director, Nadine Traboulsi, of Ferrari World AUH saying "It's still on schedule and nothing has been delayed ... It will not open in the first quarter of 2010, but it's going to be 2010", apparently referring to a different schedule than ones which had previously been made public. Original completion date was supposed to be in 2008. Formula Rossa - the fastest roller coaster in the world. Fiorano GT Challenge - lookalike Ferrari F430 Spiders racing on twin roller coaster tracks. G-Force experience - vertical ride up through the roof of the amusement park and down again, height 62m. Or 10m less according to Arabian Business 18 July 2010 - "We have the drop tower, where you are lifted up 52m." One of those rides that elicits expletives from even the most properly spoken people on the way down. Bell'Italia - simulation of aerial travel over a 6,300 sq meter miniature version of Italy following or in a Ferrari. Features include the Amalfi Coast, Monza racetrack, and Colosseum in Rome, and authentic Italian grass. Rides not open yet as of December 2010 are in grey text. Bell'Italia - scenic journey through a miniature Italy over an area of 6,300 sq meters, including replicas of Portofino, the Amalfi Coast, Monza racetrack, Roma Colosseum, Venezia, Maranello. Walk or drive a Ferrari 250 California Spider (not a real one though). Not open in 2010. Carousel - what's a theme park without a merry-go-round? This one has Ferrari cars instead of horses though. Cinema Maranello - movie theatre showing the Coppa di Sicilia film, about Ferrari race cars. Driving with Champions - go for a drive with a Ferrari race car driver in an interactive 3D show. Fiorano GT Challenge - a twin roller coaster with mock Ferrari F430 Spider cars racing each other. Different from the Formula Rossa rollercoaster. Formula Rossa - fastest roller coaster in the world, max 240 kph, 0-100 kph in less than 2 secs, 2.07 km track, 20,800 horsepower hydraulic winch system for launch. G-Force - you go up 62m through the roof of Ferrari World, and then come down again. And you'll walk funny for the rest of the day. Don't eat or drink anything too close to take-off time. Not open in 2010. Galleria Ferrari - gallery of Ferrari cars, memorabilia, films, etc, showcasing Ferrari history from 1947 onwards. Junior Grand Prix - racing school children aspiring to be Team Scuderia drivers, using child-sized F1 racing cars. Kids first need to get a driving licence from the Junior GT. Junior GT - driving school for children under 13, using scaled down models of an F430 GT Spider. Area includes road signs, traffic signals, roundabouts. Junior Training Camp - soft play area for young children with remote controlled cars, grandstand climbing, car wash with no water, Ferrari paddle boats, and a foam F1 to play with. Made in Maranello - virtual tour of the Ferrari factory, from design to circuit testing. Paddock - get a feel for being on the road with the Ferrari F1 team. Display of motor homes, transport trucks, support garage, and hospitality suite. Take part in a pit crew exercise of tyre changing and re-fueling. Or watch a multimedia show. Racing Legends - Ferrari racing history. Scuderia Challenge - Team Scuderia F1 training simulators with the Yas Marina Circuit. Discover how easy it is to crash and burn in an F1 car, and leave with a much greater respect for the skill and fitness levels of an F1 driver. Speed of Magic - adventure travel ride follows young lad chasing Nello the bad driver through oceans, jungles, caves, a volcano, and more in a 4D simulated environment. The Pit Wall - large theater with interactive racing simulations. V12 - flume ride inside a Ferrari V12 engine, entering through the grill and leaving through the exhaust. Might be a good one to end your visit with - you'll probably feel exhausted (we couldn't resist, sorry). Not open in 2010. Viaggio in Italia - an aerial trip over the Italian countryside in a Ferrari California. Well, a simulated ride or something like that, with Flora Inforno (smelly flowers), wind, and rain to make it more realistic. Open May 2012. Erm ... we've lost one, unless the restaurants count as a "ride"? Formula Rossa – The world's fastest roller coaster, reaching speeds of 240 kmph. Made in Maranello – A virtual trip behind the walls of the famous Ferrari factory in Maranello, taking guests through the intricate process of making the world's most sought after car. Viaggio in Italia – A virtual aerial voyage over Italy's cities and their main monuments, mountains and coasts pursuing a Ferrari. Bell'Italia – A miniature recreation of Italy's most famous locations, from the picturesque Portofino and the Amalfi Coast to Monza racetrack, the Colosseum in Roma, Venezia and Maranello, the heartland and home of Ferrari. The Pit Wall – An interactive theatre that allows guests to test their judgment in realistic racing scenarios. Galleria Ferrari – The world's largest Ferrari gallery outside Maranello, showcasing the most exclusive range of classic and contemporary Ferrari's from all over the world. Junior Grand Prix – After the Junior GT driving experience, budding F1™ drivers can enjoy the race track in scaled down Ferrari F1™ racers. The Racing Legends – A ride through Ferrari's greatest racing moments starting from the first races all the way to today's F1 victories. Cinema Maranello – Ferrari World's own theatre showing ‘Coppa di Sicilia', a short film that tells one of the many inspiring stories from the life of the legendary Enzo Ferrari. Junior Training Camp – An interactive play area for children where they can engage with a waterless car wash, become custom ‘constructors', climb up the grandstand, pilot remote cars, peddle their own miniature Ferrari and play with an F1™ car made of soft, guest-friendly foam. The Formula Rossa is one of the rollercoaster rides at Ferrari World Abu Dhabi. When complete, it will be the fastest roller coaster in the world with speeds up to 240 km/hr (150 mph), beating the current record holder (as of 2010), the Kingda Ka at Six Flags Great Adventure in New Jersey, USA, which has a top speed of 206 km/hr. Previous information indicated the Formula Rossa top speed would only be 200 kph? The Formula Rossa roller coaster will be launched by hydraulic winch system with 20,800 horsepower which will fire the cars to a height of 52 meters, hopefully still attached to the track. Passengers will be given protective goggles to help prevent dust, flies and birds trying to take out their eyes at over 200 kph. If you've ever seen what a bird does to a car windscreen at that sort of speed (it can go right through), you might not want to sit in the front row of the roller coaster. Cars are modeled on the Ferrari F1 cars, each one holds 4 passengers, and each train consists of 4 cars. Ground area occupied by the roller coaster ride is 8.48 hectares (21 acres or 84,800 sq meters). Ride length is 2.07 kilometers and takes just 90 seconds (average speed of 80 kph). Passengers will experience g-forces of 1.7G according to FWAD information - "and see what 1.7 Gs really feels like." Or 4-4.5G according to Claus Frimand, UAE General Manager of Farah Leisure, the FWAD operating company who said "You are launched with similar technology to what they have on an aircraft carrier, using 40,000 litres of hydraulic fluid. You will experience G-forces of four to 4.5, very similar to what drivers can experience." Reported in Arabian Business 18 July 2010. Whatever the correct figure is, might be a good idea not to take it on straight after lunch. Mr Frimand also said "The Formula Rossa Coaster is the fastest coaster in the world, easily. It goes 0-100kph in four seconds, by the end of the first 200m stretch you have reached 240kph and then you shoot up 52m, and then two big figure of eights to slow down," which sounds a bit odd - information from the FWAD press release said "Formula Rossa, which powers them to 240 kmph in less than five seconds." And previous FWAD information said "0 to 100 km in 2 seconds." Anyway, it seems hard to believe the cars do 0-100 kph in 4 seconds, then 100-240 kph in just one more second. Bell'Italia is a scenic tour through a miniaturised version of parts of Italy with buildings scaled down by 1:20, driving a Ferrari 250 California Spider (not a real one), or walking along the 570 meters of walkways. Bell'Italia area is about 6,300 sq meters and has 17 stops, including Portofino, the Amalfi Coast, the Monza racetrack, the Colosseum in Roma (Rome), Venezia (Venice), the Terme di Caracalla Circuit in Roma, and Maranello - the home of Ferrari. Landscaping includes real grass and plants, native to Italy. Mountains modeled on the Italian Alps. Designers are JRA of USA, and General Display SRL of Italy. The usual selection of junk food and drinks you'd find an any amusement park. Maybe with a Ferrari toothpick in your hamburger. Press releases and FWAD mention Italian food. Two restaurants "inspired by the real Maranello food experience" according to FWAD information - not clear if that means from the town of Maranello in Italy, or really fast food delivered by a Ferrari 550 Maranello. A delicatessen with fresh pasta and pizza. Ferrari t-shirts, baseball caps, and other merchandise for sale (of course). At least 2 Ferrari stores - one with vintage and contemporary racing memorabilia (area 825 sq m), another with the regular Ferrari merchandise and also special FWAD souvenirs (area 1300 sq m). Unknown if you can buy a real Ferrari car at the Ferrari Park, but perhaps the driving school will have real ones to drive. April 2007 - Aldar announces the exclusive agreement with Ferrari to build the Ferrari Theme Park on Yas Island. MICE (Meetings, Incentives, Conferences/Conventions, Exhibitions/Events) and other special events and product launches. First Gulf Bank (FGB), an Abu Dhabi bank, signed a 3 year sponsorship agreement with FW-AD to provide banking services in the park. As part of the agreement, FGB Platinum card holders get a free upgrade to premium tickets when they buy standard admission tickets. FGB will also sponsor the Junior GT ride at FWAD (press release 20 April 2011). Or sign up on the FWAD website for news and information. No tel contact available yet. Last update Tuesday 12-Jun-2012. Page development 4L 5C. www.dubaifaqs.com/ferrari-world-abu-dhabi.php (PDF and print version).